Starting in early 2018, Starbucks Canada added a new paleo/ketogenic friendly fast food option to satisfy our cravings for a quick and easy healthy breakfast. Meet “Sous Vide Egg Bites“, Starbuck’s response to customers’ requests for non-wheat based menu options. These perfectly cooked cage-free eggs prepared as Egg Bites were first introduced to the US market in early 2017 and were a tremendous hit with their customers. This grab-and-go protein-fast-food approach is all the trend nowadays. Sous vide cooking (pronounced “sue-veed”) is a special cooking method using a water bath held at precisely controlled temperatures to cook food evenly and retain flavours. Sous-vide by itself translates as “under vacuum” in French, which is a reference to vacuum-sealing the food while immersing and cooking it in hot water. This is also a preferred method of cooking because it doesn’t require extra harmful fats and oils. According to Starbucks, the result of cooking the eggs sous-vide is a creamy, velvety texture with flavour that is satisfying and makes you feel like your eating something indulgent whilst also being healthy. One thing for sure, you never have to worry about eating an overcooked Egg Bite, as Sous Vide enables a level of control over a food’s texture that no other cooking method can provide. By maintaining a consistent temperature Starbucks has mastered the process for keeping the final texture of the Egg Bite perfectly thick, velvety, creamy and smooth…and not too gelatinous (A common problem of cooking eggs Sous Vide style with water that is just slightly too hot or too cold). 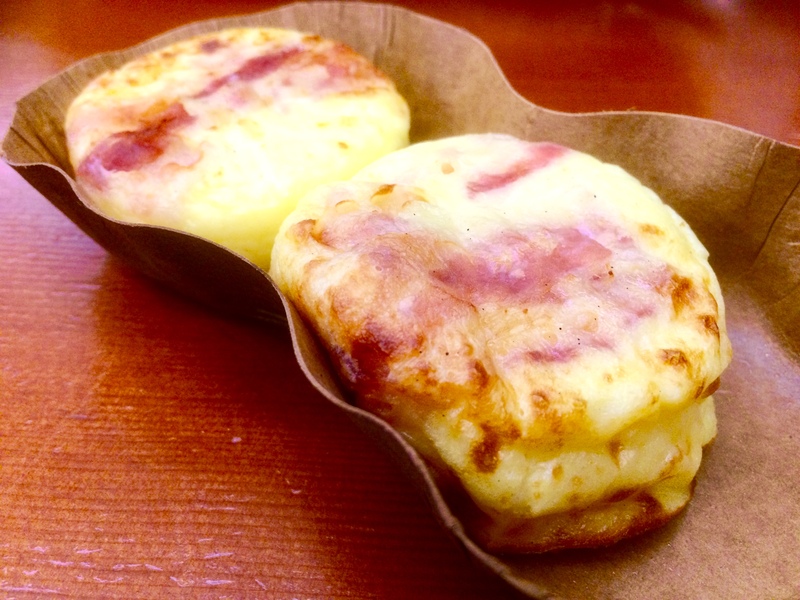 Starbucks offers two very affordable Egg Bite options, costing $4.75 CAD for a pair ($2.37 CAD each) that comes served on a thick recyclable paper tray. One is the “Bacon & Gruyere” and the other is the “Egg White & Red Pepper“. A couple of days ago I had the pleasant surprise of being treated to the “Bacon & Gruyere” Egg Bite. This non-vegetarian option was bursting with flavour because it’s made with aged Gruyere and Monterey Jack cheese topped with Applewood smoked bacon. The combination is a delicious high protein snack (19 grams of protein per Egg Bite) with very low carb content (only 2 grams of sugar and a total of 9 grams of carbs per Egg Bite) with a moderate number of calories (320 calories per Egg Bite). 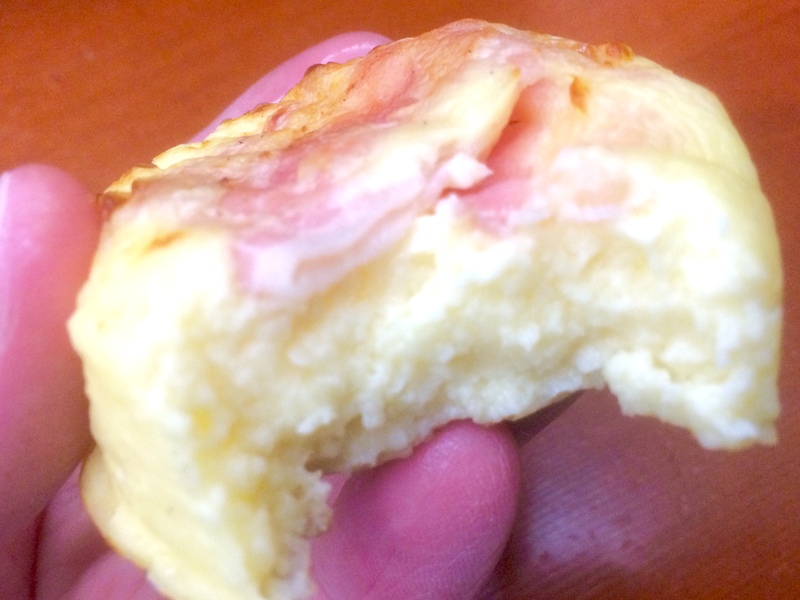 What makes this Egg Bite unique is that they use uncured bacon with no nitrites or nitrates added except as naturally occurring in sea salt and celery juice powder coupled with spongy egg full of air pockets that melt almost like cream. The other Egg Bite (Which I haven’t tasted but am eager to try) is the “Egg White & Red Pepper” vegetarian version. This has about half as many calories so it’s way healthier, clocking in at a low 170 calories per Egg Bite, with 2 grams of sugar, 13 grams of total carbs and a reasonable 13 grams of protein. This savoury option uses Monterey Jack cheese, plus spinach and fire-roasted red peppers. The only drawback of ordering these Egg Bites is that they are extremely hot when served, making it necessary to wait quite a while until they cool down. The reason for this is because Starbucks has opted to cook the sous vide egg bites in advance, freeze them, and then later reheat them to the exact same temperature without compromising the quality or texture! I happen to agree with their approach, as the taste of the Bite isn’t compromised in any way…it just means that sometimes picking up the Bite or biting into it too soon can result in burning your fingers or tongue.